P eriodontal disease is a dental condition that plagues millions of people, maybe even you, yet most of them aren’t even aware; so how are you supposed to prevent it? 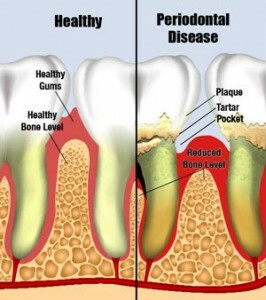 Periodontal disease is a type of infection that affects the supporting tissues surrounding your teeth. It is caused by the plaque-forming bacteria in your mouth. While everyday brushing and flossing of your teeth does remove most plaque, it is impossible to remove all of it. The plaque residue that is left behind hardens and becomes tartar. Your gums become irritated and swollen with infection caused by the tartar forming below the gum line, ultimately leading to gum disease. Although widespread, periodontal disease is a condition that can easily be prevented. There are two stages of periodontal disease: gingivitis and periodontitis. Gingivitis is the first stage of periodontal disease. This is when bacteria wriggles in between the tooth and gum, lodging itself there, invoking inflammation. If caught early on in this stage, periodontal disease can quite easily be eliminated by a daily brushing and flossing routine. But when left untreated, periodontal disease can advance into the more serious periodontitis, which can damage the teeth, gums, and surrounding bones beyond repair. Periodontitis is a more serious condition due to the fact that the tissue holding the teeth to the jaw bone is destroyed, ultimately resulting in possible tooth loss due to exposed tooth roots, as well as increase decay, inflammation, and receding gums. The use of tobacco is among the factors which can increase the odds of developing periodontal disease. Other factors consist of specific systematic conditions like diabetes, or drugs like steroids, cancer treatment medications, oral contraceptives, different epilepsy treatments and calcium channel preventatives. Improperly fitting bridges, old fillings, which have become defective, crooked teeth and pregnancy are also risk factors for periodontal disease. Researchers have found that people with gum disease are almost twice as likely to suffer from coronary artery disease, an expert and general dentist point out. The prevailing wisdom is that bacteria in your mouth impacts your heart via the blood stream. Once it gains entry, it connects with fatty plaques in the heart’s blood vessels. This agitates clot formation. Experts offer the following tips to maintain optimal dental health and prevent periodontal disease. First, you need to brush and floss your teeth at least twice a day. There are areas in the mouth where a toothbrush can’t reach; removing plaque and food particles left behind by the toothbrush can be accomplished by flossing. Trade out your toothbrush for a fresh one every three months or when you notice wear and fraying of the bristles. Fluoride toothpaste and antibacterial mouth rinse are also recommended to help fight against tooth decay. Make sure you also eat nutritious and well balanced diet. The five food groups–vegetables, meat protiens, dairy, grains, and fruit–offer a wide range of foods to help you maintain a balanced diet. Get a dental checkup and professional tooth cleaning at least every six months. If you think you’re developing signs of periodontal disease, don’t wait for your checkup to ask your dentist – call the office immediately. Periodontal disease’s symptoms include red, swollen or tender gums that either bleed easily or pull away from the teeth, chronic bad breath or a bad taste, and loose or separating permanent teeth, the appearance of pus between your teeth or gums when pressed, as well as a change of your teeth alignment when you bite or in the fit of your partial dentures. For questions or concerns about periodontal disease, call us or contact us.